To get started, you will need an activation code from your system administrator to use the application. The application cannot be used without this code. Once activated, you are ready to start using the app. 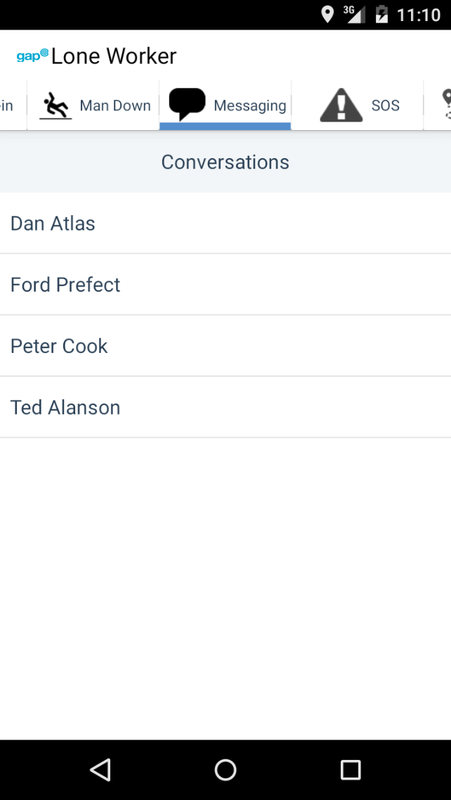 Please note that many of the features in the Lone Worker app trigger notifications to alert you about important events (check-in required, man down detected, etc.). These notifications will only be triggered when the app is running in background, or the phone has been locked. All of the features are instantly accessible from the scrollable top menu. Drag it horizontally to see more options. Please note that some app features and / or settings may be hidden or locked by your system administrator. Drag the handle of the “slide to start SOS” slider all the way to the right to start sending emergency messages to the portal. You can change the frequency of the messages by changing the option displayed near the bottom of the screen (labeled: “Send an SOS position update every:”). Just tap it to open the picker. 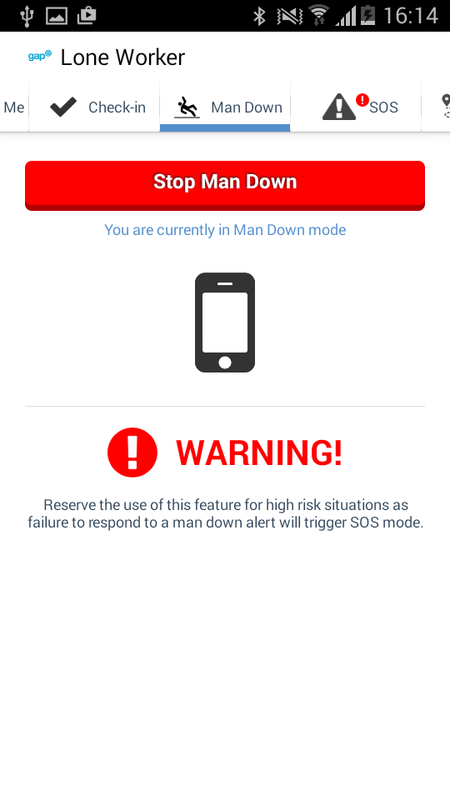 Once in SOS mode, all other messages transmitted (tracking, monitoring, and check-ins) will also be flagged with the emergency status. 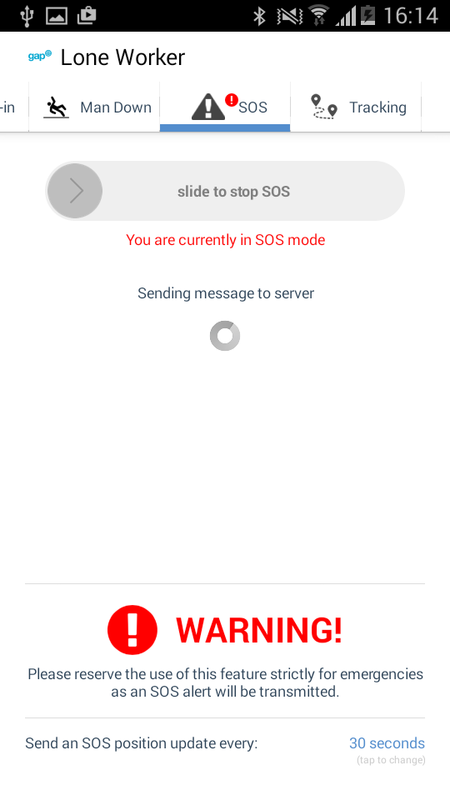 SOS messages will continue to be sent until the emergency is cancelled using the slider, even if the app is running in the background or the phone is locked. This feature allows you to be monitored by the portal. 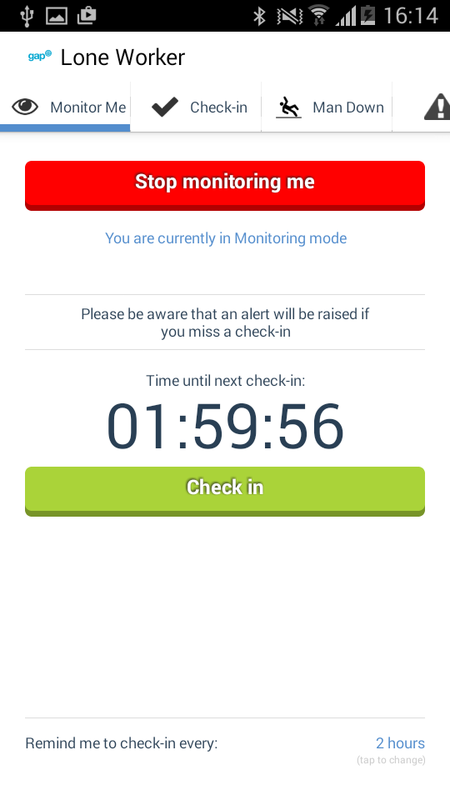 Once monitoring has been started (by tapping the "Start Monitoring Me" button), the countdown until the next required check-in is started and the Check-in button colour changes to green. 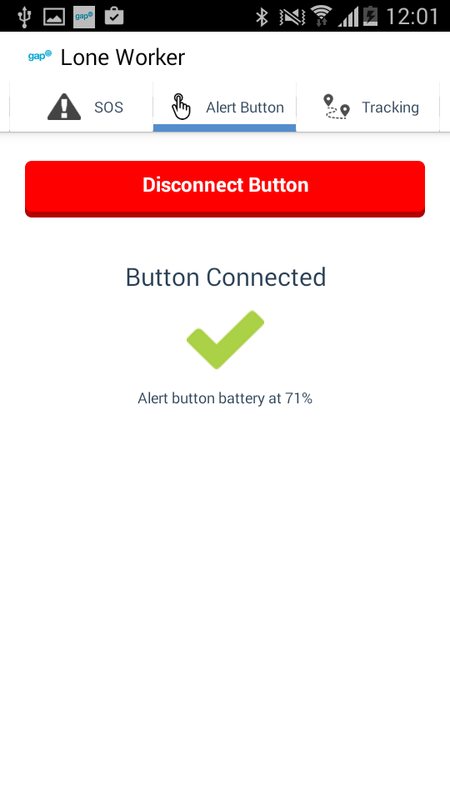 If the app is moved to background (if you need to run another app), or the phone is locked, a notification will be displayed when it is time to check-in. 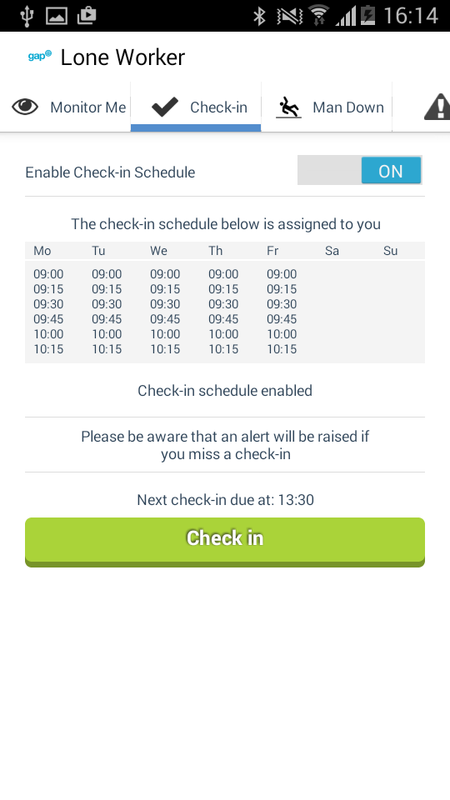 The portal will raise an alarm if you fail to check-in regularly at the interval displayed near the bottom of the screen. This interval can be changed by tapping on it. The monitoring will continue until the "Stop Monitoring Me" button is tapped, even if the app is running in the background or the phone is locked. 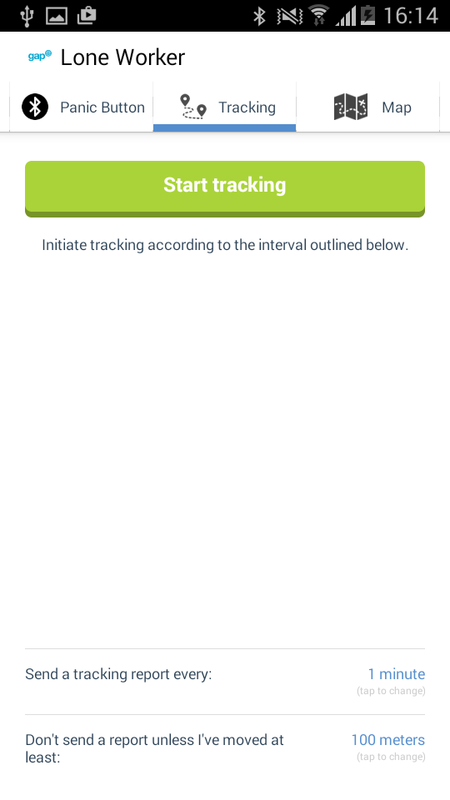 Tap the "Start tracking" button to begin sending your current position to the portal. This will continue until you tap the "Stop tracking" button, even if the app is in background mode or your phone is locked. Don't forget to stop tracking when no longer required, as it may cause the phone's battery to drain more quickly than normal. 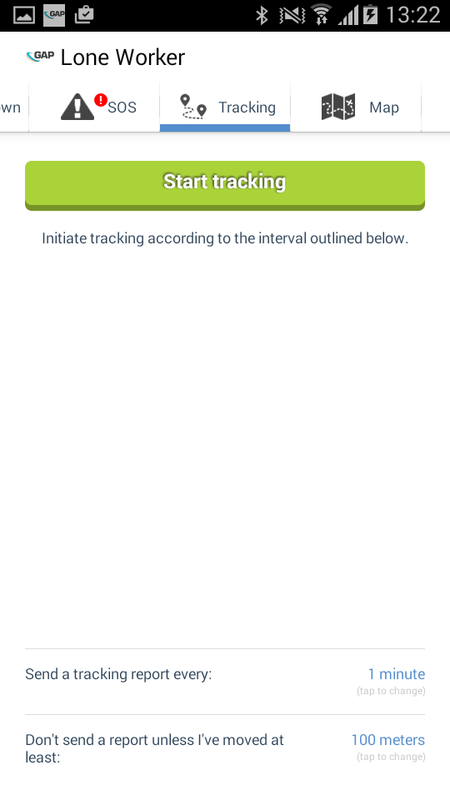 The frequency of the tracking reports can be configured using the options shown near the bottom of screen. 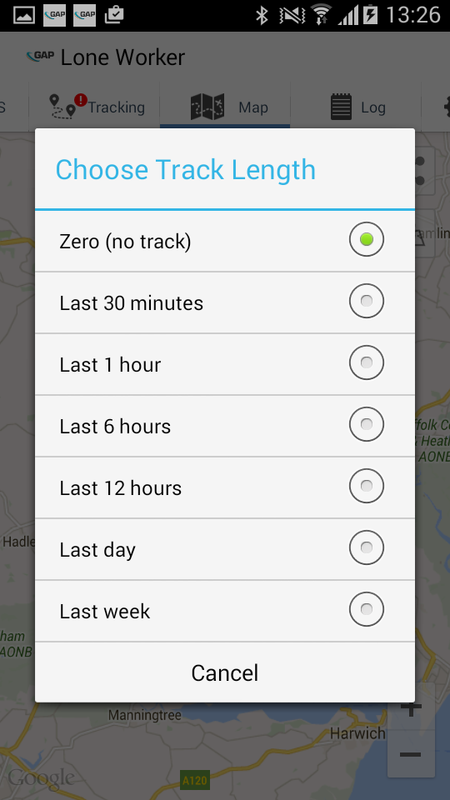 The first option controls the time between reports, and the second tells the phone to only send a new tracking report if it has moved a certain distance since the last one was sent. These options can be changed by tapping them. 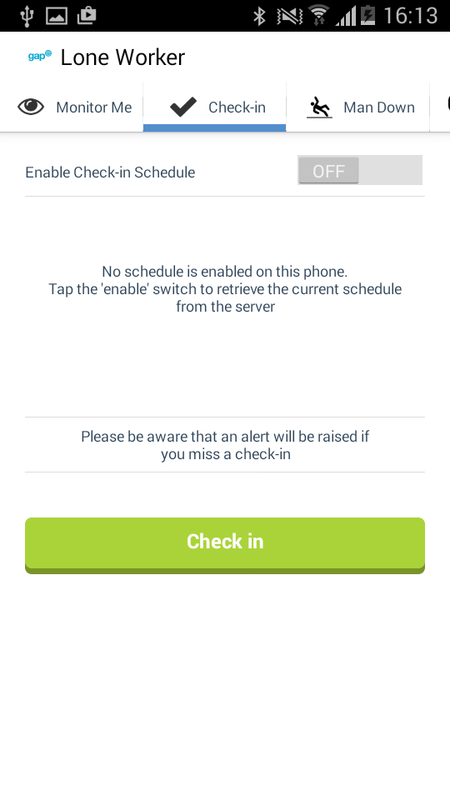 This feature allows you to check-in based on your server-side schedule. Each time the app is started, it will download the latest schedule from the portal. You can enable/disable your schedule using the switch displayed in the top-right corner of the screen. 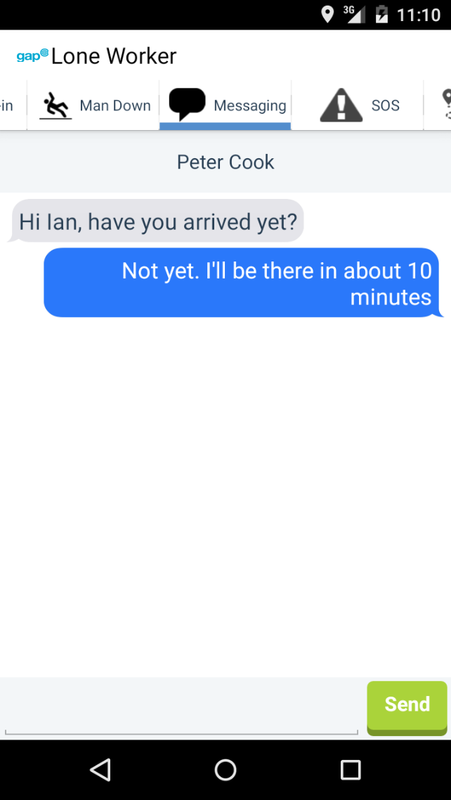 Once a schedule has been downloaded to the phone, the app will display a notification each time you are required to check in. This will occur even if the app is in background or your phone is locked. To check in, just tap the “Check in” button. 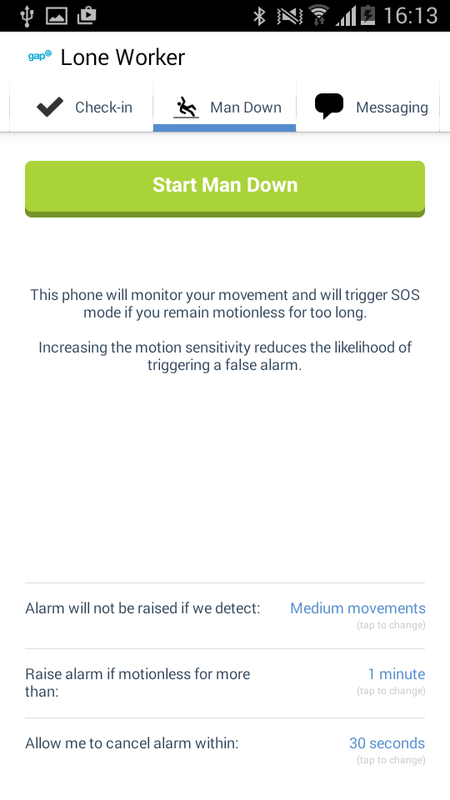 Once this mode is started, the phone will monitor your movement and will immediately trigger SOS mode if you remain motionless for too long. There are three configuration options displayed near the bottom of the screen. 1. Motion sensitivity. Increasing the sensitivity reduces the likelihood of triggering a false alarm. 2. The length of time before the alarm is triggered. 3. Cancellation window. A cancellation window can be setup which will alert you before the SOS is triggered and give you the opportunity to cancel it. Set this to zero if not required. The log screen displays a scrollable list of the last 200 events that have occurred since you started the app. You can clear the log by tapping the 'Clear Log' button at the bottom of the settings screen. The map screen displays a marker showing your current location (this marker can be tapped to display the lat/lng). Near the top right corner there is a button for displaying a track of your reported positions. Tap it to display a picker to choose the track length (by time). Choose zero to remove the track. You can share your current location with other people by tapping on the share button which is positioned above the show track button. The messaging screen displays a list of messages sent to the application. Clicking on the username will show the converstion history, and allow you to reply. A red "badge" will show on the app's home screen icon showing the number of unread messages (applies to Samsung and Sony devices only). 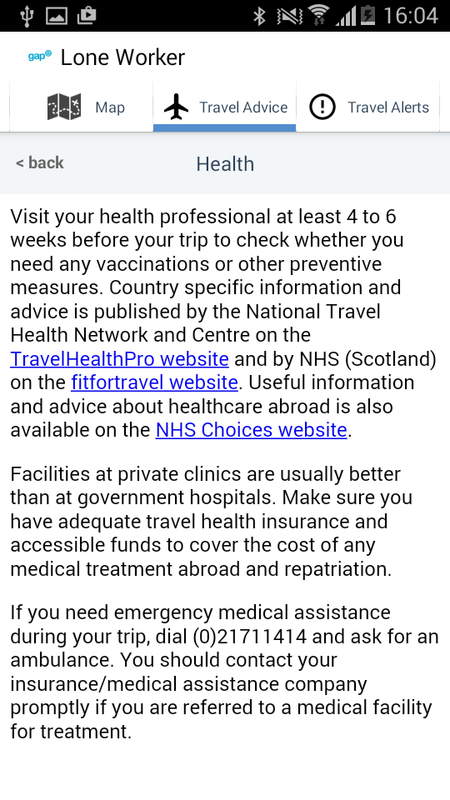 The Travel Advice screen displays travel advice provided by either the United Kingdom Foreign & Commonwealth Office or the US State Department. Only GAP user accounts with their "Citizenship" option set to United States will see advice from the US State Department. 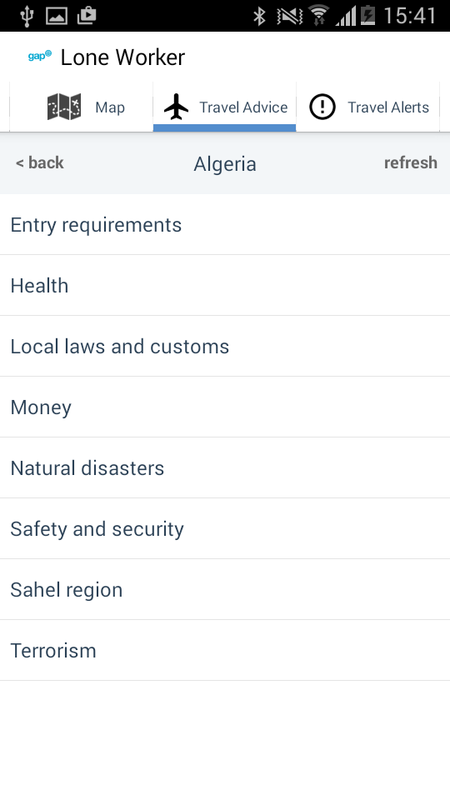 This setting can be changed under "My Profile" in the GAP Portal. 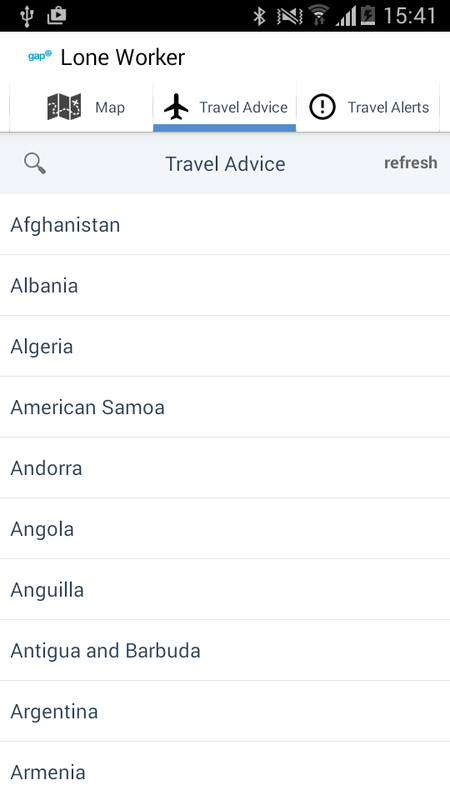 Clicking on a country will display a list of headings. 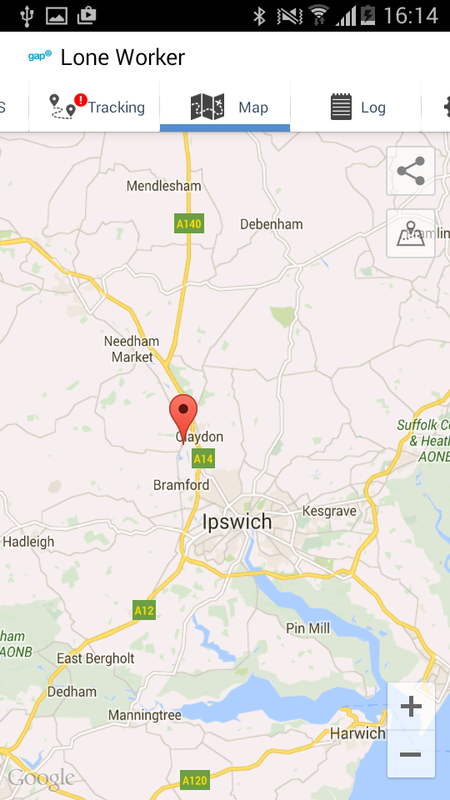 Clicking on a heading will show detailed information. 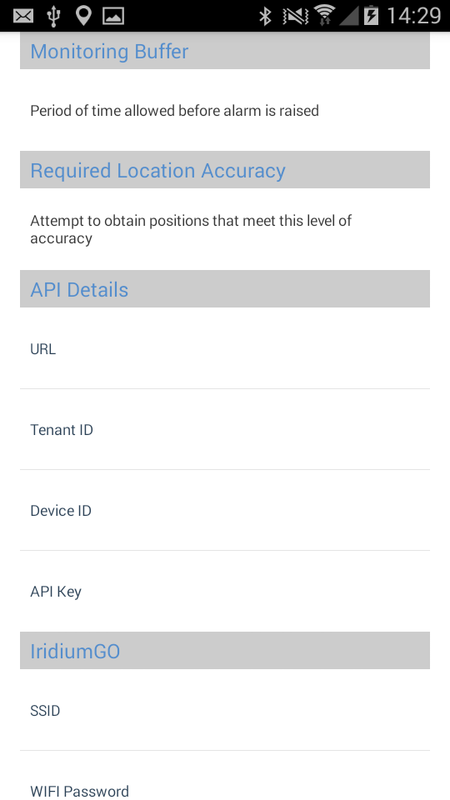 The GAP Lone Worker app supports triggering of an SOS alert via a wireless (Bluetooth Low Energy) button called the V.BTTN. 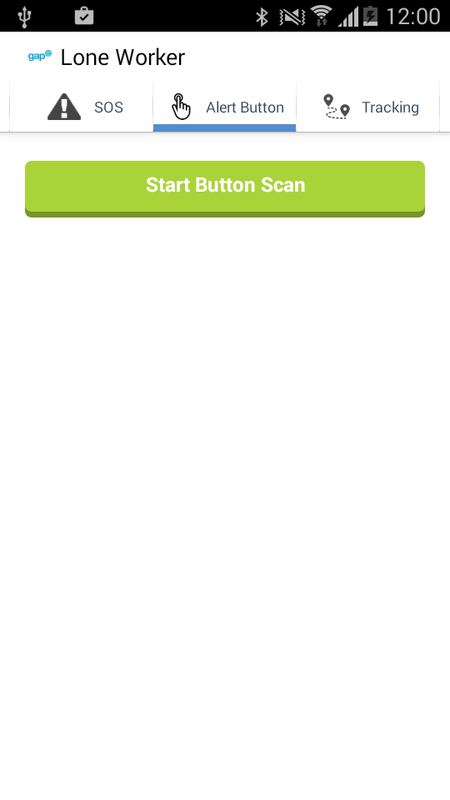 Then, in the app, go to the "Alert Button" tab and tap on "Start Button Scan". 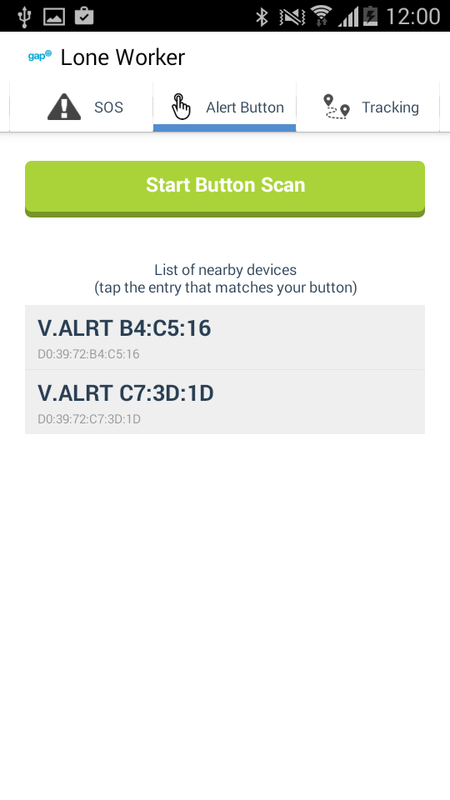 The app will scan for the V.BTTN and, once found, display its identifier in the list. Tapping on the V.BTTN identifier will pair the devices. Once complete, the V.BTTN will beep and a confirmation screen displayed in the app. If this does not occur, press an hold the V.BTTN for 10 seconds (to reset the button) until you hear a beep and then try again. 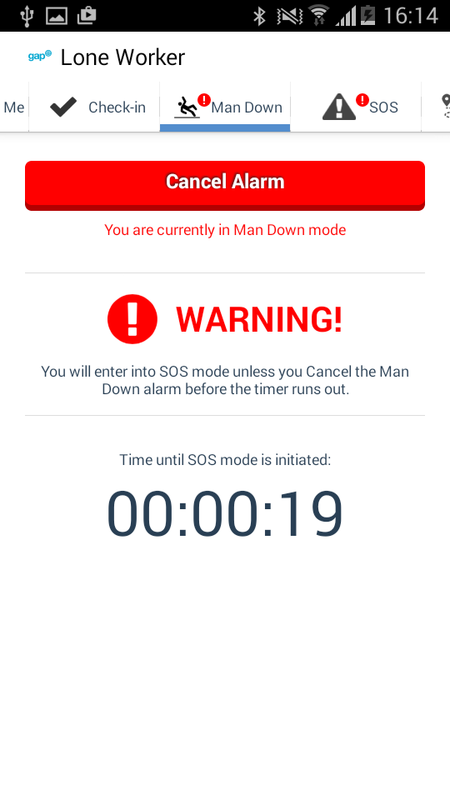 To trigger an SOS alert via the V.BTTN, press and hold it for 3 seconds. 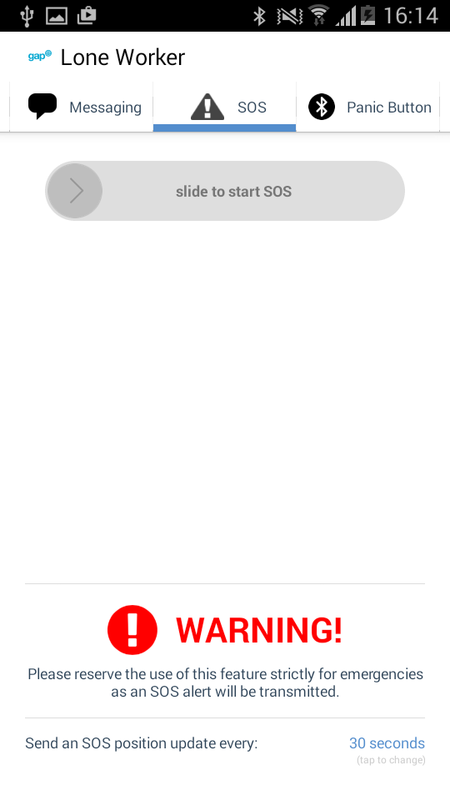 SOS alerts can only be cancelled using the SOS alerts tab. To disconnect your V.BTTN, tap the "Disconnect" button. 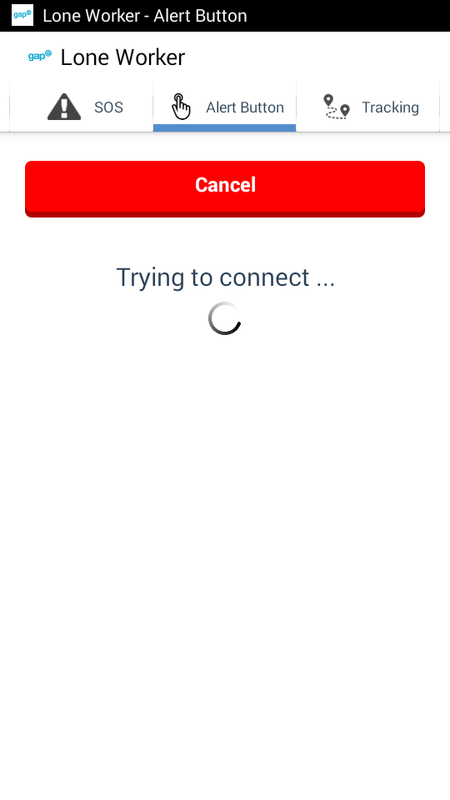 To reconnect, tap "Connect To Button". 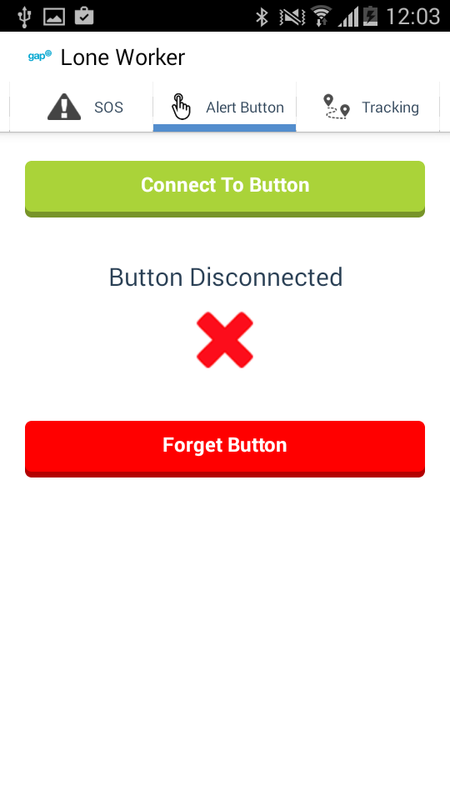 To disconnect the V.BTTN and prevent it from reconnecting, tap "Forget Button". If your V.BTTN goes out of range, you will receive repeated notifications of this until such time as the V.BTTN reconnects or you disconnect the V.BTTN. The app will try to reconnect constantly should connectivity to the V.BTTN be lost. This screen contains extra configuration options for the app. 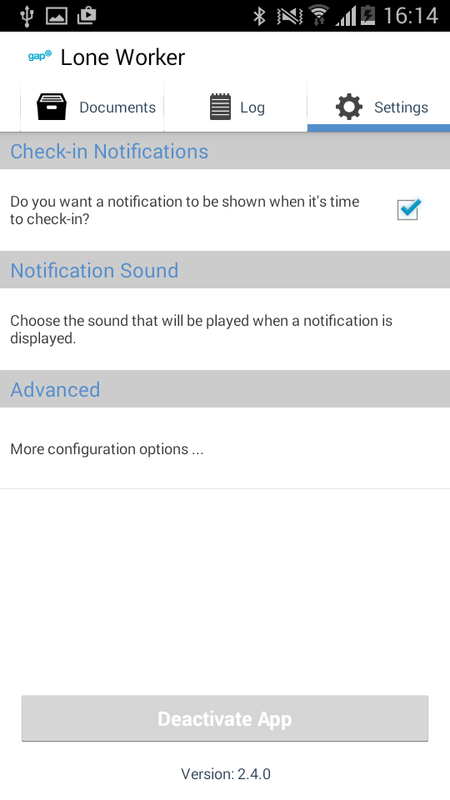 Show Check-in Notifications - Should the app remind you to check-in via a notification message when the app is in the background or the phone is locked? 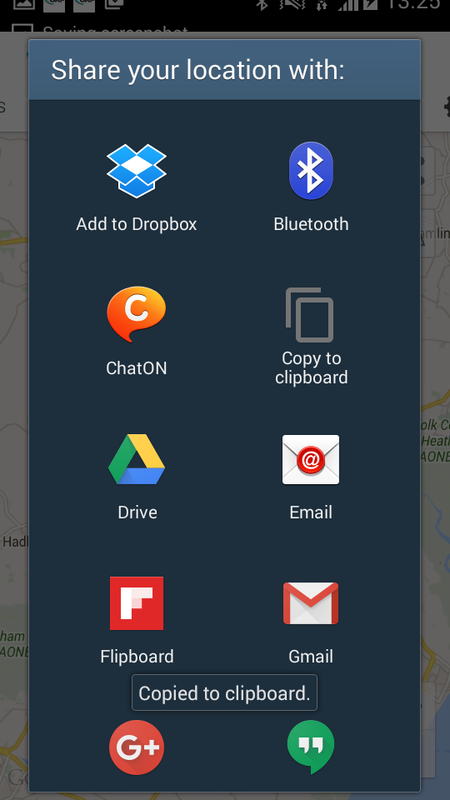 Deactivate App - Deactivates the application. WARNING: This option will stop your app from sending and receiving data (including SOS alerts). 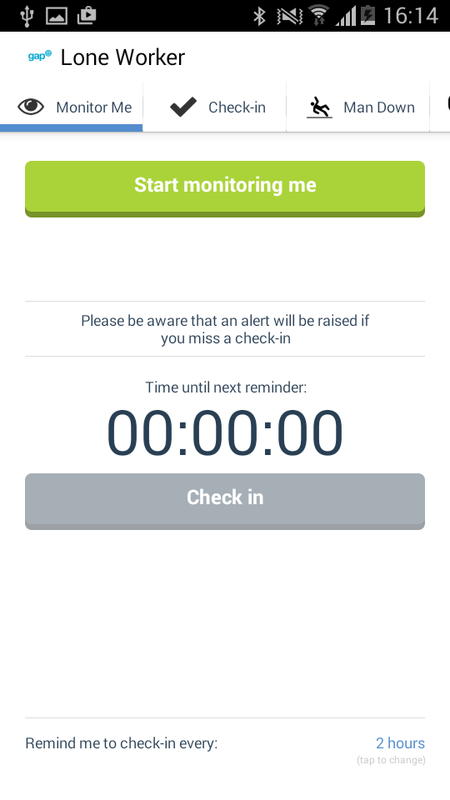 Monitoring Buffer – This is the period of time before or after a check-in is due that you check-in. Example: If you are due to check-in at 10:30am and the buffer is 5 minutes, then you can check-in anytime between 10:25am and 10:35am and the alarm will not be raised until 10:35am. Required Location Accuracy - The desired level of accuracy for position data. Setting a smaller (more accurate) value (i.e. 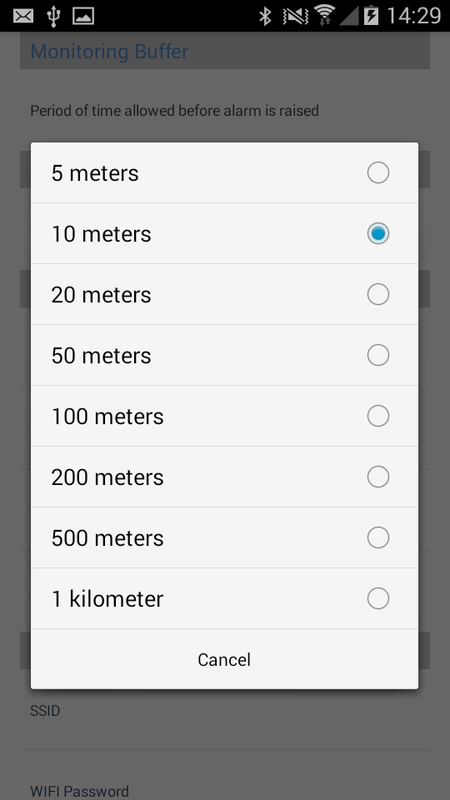 10 metres) may result in longer time to acquisition and shorter battery life.